" Quality Neak Pean Temple professional, friendly service are our priorities "
History Of Neak Pean Temple : Some historians believe that Neak Pean was Built by King Jayavarman VII, it represents Anavatapta, a mythical lake in the Himalayas whose waters are thought to cure all illness. 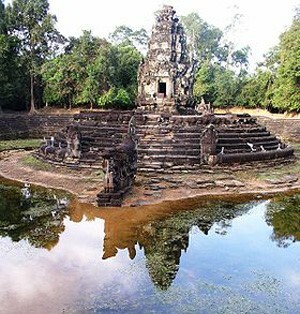 Neak Pean was originally designed for medical purposes, as it is one of the many hospitals that Jayavarman VII built. It is based on the ancient Hindu belief of balance. Four connected pools represent Water, Earth, Fire and Wind. The ancients believed that going into these pools would balance the elements in the bather, thus curing disease. In the middle of the four healing ponds is the central water source. There is a statue of Bahala (Bodhisattva Guan Yin transformed into a horse), as a symbol of drowning prevention.